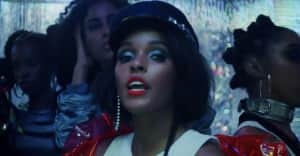 Earlier this month, Janelle Monae's Wondaland Records released a fiery, political single, "Hell You Talmbout." The song named victim after victim of racially-motivated violence, and it was accompanied by a statement: "We recorded it to channel the pain, fear, and trauma caused by the ongoing slaughter of our brothers and sisters. We recorded it to challenge the indifference, disregard, and negligence of all who remain quiet about this issue." Now Wondaland is offering others the chances to join its sonic protest: the label released the "Hell You Talmbout" instrumental today and encouraged people to use it as the template for making a personalized protest song. Wondaland also asked that listeners upload the result of their efforts to SoundCloud. Download the instrumental here and follow the instructions above. "This song is a vessel and now it is YOUR tool," the label noted. "We've created this space for YOU to join us in honoring the memory of individuals that have been victimized by systematic oppression and abuses of power in our communities. It is our hope that, together, our voices can be a force that adds to a movement for recognizing our collective humanity. The practice of policing those who are Other must come to an end." Revisit the original version of the single below.